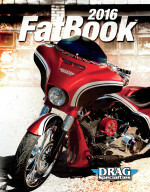 This deep drawn, real steel stretched tank kit is the ultimate complement to your Bagger project. Tank flows seemlessly from front to back and the stretch wings flow into the side covers. Direct bolt-on replacement for all 10-17 HD touring models; no modification required. Each 6.5 gallon tank is handcrafted and factory pressure tested. Kit includes tank, steel dash, chrome pop-cap, rubber dash trim and hardware.